In the face of the oppression from non-believers mentioned in the previous verses (James 5:1-6), James says they are to “be patient” which is the Greek word makrothymesate that is used most often to refer to patience toward people, not situations (which is hupomone). The idea of patience here is to avoid seeking revenge or try to get your equal share here in time, but instead, to show self-control concerning the temptation towards trying to balance the books with oppressive unbelievers. The motivation for the ability to be “patient” is an expectant waiting on the Lord. The use of the word “until” (hoes) gives the idea of enduring a period of time in order to accomplish the goal. So, James is saying, “exercise patience as you wait for, and look for, the coming of the Lord because he will balance the books with justice.” This patience is a life long trait of believers in time who are waiting for something that will not come in this lifetime. The farmer planting seeds and waiting for harvest is the example that James uses. The farmer serves as an illustration of the words “Stand firm” which are the NIV’s translation of sterixate tas kardias hymon which literally means “strengthen your hearts.” Sterixate is “you strengthen” in the active imperative, so it is a command for you to do the work of strengthening or “establishing” “your” (hymon) “heart” (kardias). I will be patient and while I am waiting on God I will strengthen my heart with his Truth and promises. 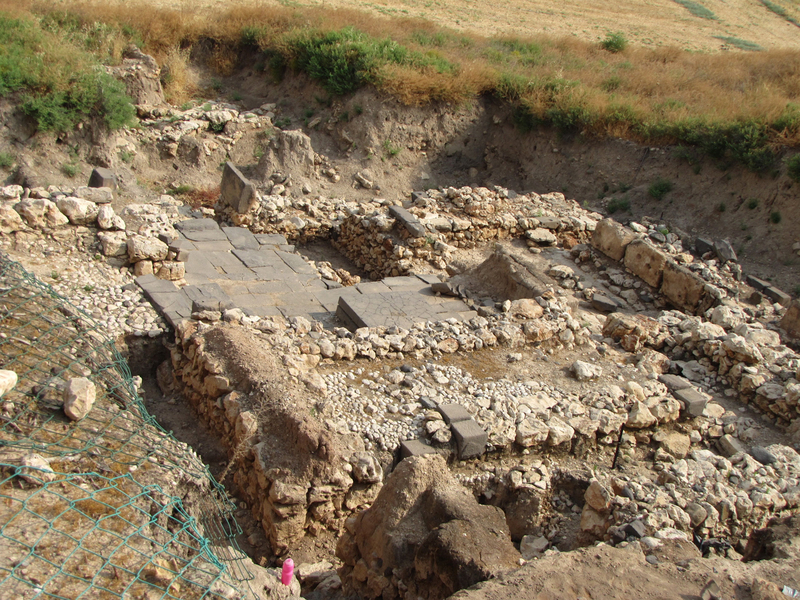 Cultic center at the gate leading into the upper city of the Canaanite city of Hazor. 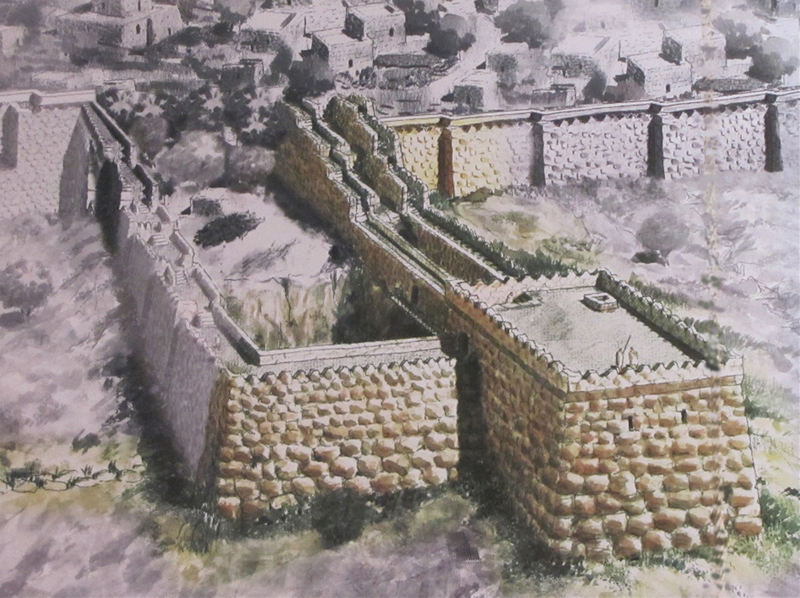 An artists drawing of the Gihon Towers based on the latest archaeology research. In First Kings 19:13-15 while Elijah is hiding at Mt. Sinai he is told by God: "Go back the way you came, and go to the Desert of Damascus. When you get there, anoint Hazael king over Aram." The Assryia king, Shalmaneser III, records that he defeated Hazael and took many of his chariots and horses. Shalmaneser writes that he pursued Hazael "shutting him up in his royal city Damascus." (Details 1, 2.) Also, it is likely that Hazael was the one who placed the Tel Dan Stele in the courtyards of Dan's city gate. If God has called you to a purpose, he will also prepare and equip you for that purpose. 5 Now listen, you rich people, weep and wail because of the misery that is coming on you. 2 Your wealth has rotted, and moths have eaten your clothes. 3 Your gold and silver are corroded. Their corrosion will testify against you and eat your flesh like fire. You have hoarded wealth in the last days. 4 Look! The wages you failed to pay the workers who mowed your fields are crying out against you. The cries of the harvesters have reached the ears of the Lord Almighty. 5 You have lived on earth in luxury and self-indulgence. You have fattened yourselves in the day of slaughter. 6 You have condemned and murdered the innocent one, who was not opposing you.